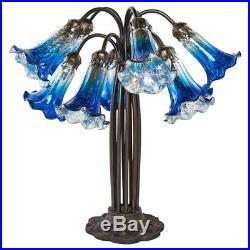 21 inch High Mercury Glass 10 Lily Downlight Table Lamp-Dark Blue and Silver. 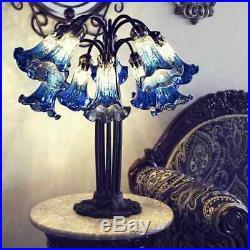 This 10 lily downlight table lamp is handcrafted with vibrant, dark blue and silver tone mercury glass. The lily shades have a beautiful glow that will create an amazing focal point to any space you chose. The base is made with 100 percent hand cast metal and the overall craftsmanship is absolutely exquisite. Product dimensions21 inches wide x 21 inches high. Requires 10 15 watt bulbs (not included). Cord length is 66 inches. CareClean with a dry, clean cloth. 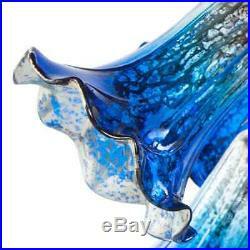 Lamp typeTable lamp, accent lamp, buffet lamp, desk lamp, specialty. Height20 inches to 23 inches. Width16 inches to 18 inches. You may contact your states Department of Revenue for details on how to file this return. The item "21 inch High Mercury Glass 10 Lily Downlight Table Lamp-Dark Blue and Silver" is in sale since Saturday, February 10, 2018. This item is in the category "Home & Garden\Lamps, Lighting & Ceiling Fans\Lamps".